Kirsten Johnson has recorded the complete piano music of ?Boston Six? composer Amy Beach (1867-1944). This last disc in the series includes all of her final opuses for piano. Old Chapel by Moonlight, From Six to Twelve, A Bit of Cairo, and A September Forest (in manuscript) are all world premiere recordings. Nocturne, which opens the disc, is classic Beach, full of rich chords and sonorities with long melodic lines. A Cradle Song of the Lonely Mother is hypnotic and soulfully beautiful. Johnson?s technical ability and natural flair for these pieces conveys the chipmunks and hummingbirds of Three Pianoforte Pieces, op. 128, with great ?lan. 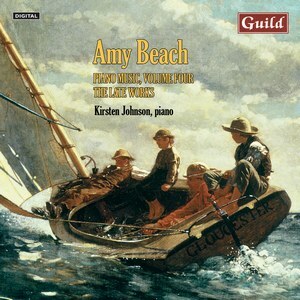 Amy Beach: Piano Music, Volume Four, The Late Works is a wonderful culmination of this recording project, a marriage of the pianistic talents of Kirsten Johnson with the compositional greatness of her compatriot Amy Beach.